They haven’t stopped yet. They spent a week in New Zealand, two weeks in Vancouver, and drove across Canada to spend five months on Wolfe Island, Ontario, before dipping south into the USA. Traveling with one kid can bring worried frowns. But traveling around the world with six kids — the youngest being at a notoriously difficult age — is enough to make some parents sweat like a pack of wolves were chasing them. 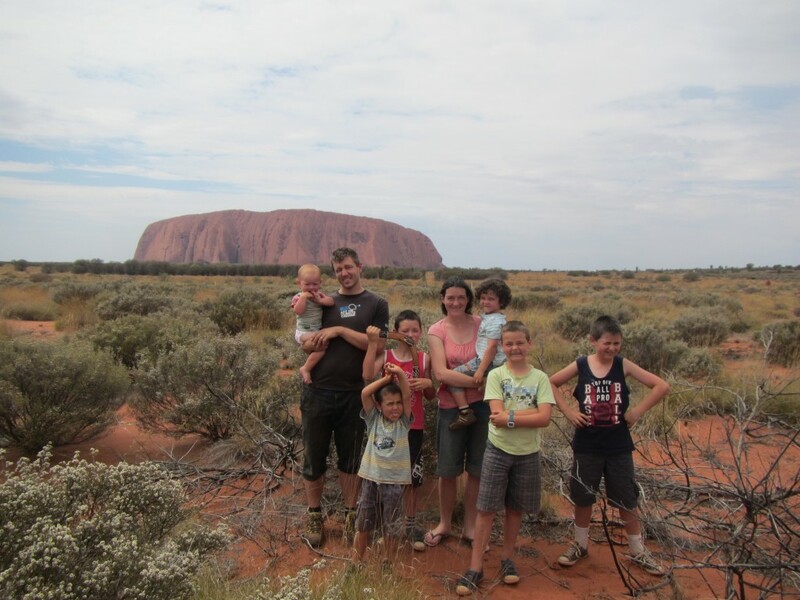 I had the privilege of asking Jacqui and James how they make travel as a family work. They even graciously answered my burning questions about how to travel with a new baby! James works as a remote web developer, while Jacqui heads up their kids’ home education. Tell me a bit about how you balance travel and work and school for your kids. We brought some of our school supplies with us. Our kids love books, so library access is probably our best resource. Usually, we do our book time in the morning then get outside in the afternoon. When you meet people and they find out you are home educating, they will lend you interesting books — or even offer their time to show you interesting things. Maple tree tapping, anyone? You travel with your 6 kids under 12 years old. What are some of your “money and travel” tips for keeping costs low so you can continue traveling? We cook our own food and rarely eat out. Instead, we’ll go to the supermarket and buy food that we can cook. We carry a basic kitchen set with us: bowls, plates, cutlery, some utensils and a camping cook stove. At home, we tended to live quite frugally: older cars, opt for cheap or free activities, our kids wear pre-loved or homemade clothing, and shared a house with Jacqui’s parents. 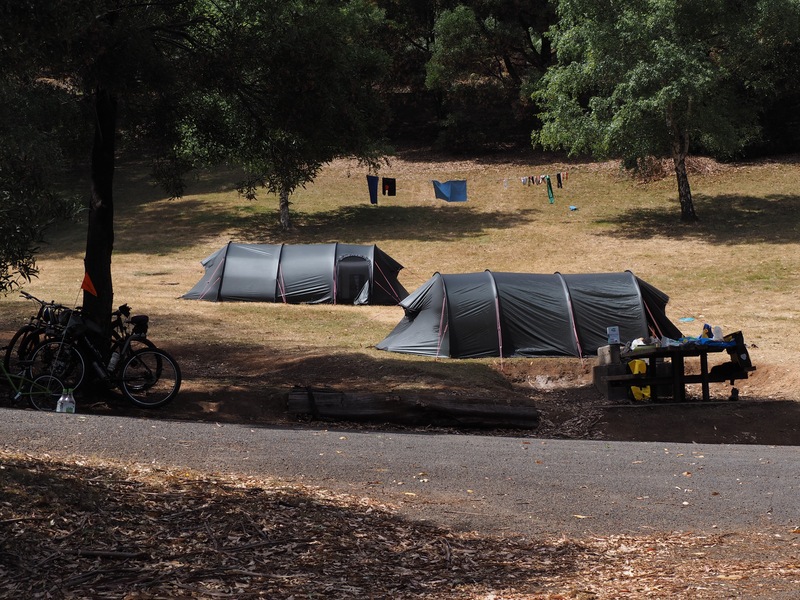 We have two hiking-sized 4-man tents we bought for our cycle tour with sleeping bags and mats. They have probably paid for themselves in the amount we have saved by camping rather than staying at hotels or even hostels. For example in Banff, we spent $25/night for a campsite compared to $300/night for a big enough room. We do free or cheap activities more often, with the occasional expensive one. When we go somewhere more expensive, we’ll take a picnic lunch. When we recently went skiing in Canada, taking our lunch saved about $50. Tell me why you decided to make traveling as a family a priority. Thinking back on my own childhood, what my family talked about most often were the trips and adventures we had. Our kids are around for a relatively short time. Let’s make it memorable! What’s your #1 tip for parents traveling with their kids? Get them to bed at a decent time most nights: well-rested kids are more fun than tired, grumpy ones. Travel slow, and have plenty of downtime to explore. What was the biggest surprise you learned when traveling with kids? Or in what ways have you seen travel impact your kids? We are complimented on their behaviour, and think that speaks to their character. It is encouraging to hear those good things. While travelling, we are so often confronted with each other’s flaws. They still complain and whine, but when the going gets tough we have seen them step up and do what is needed. 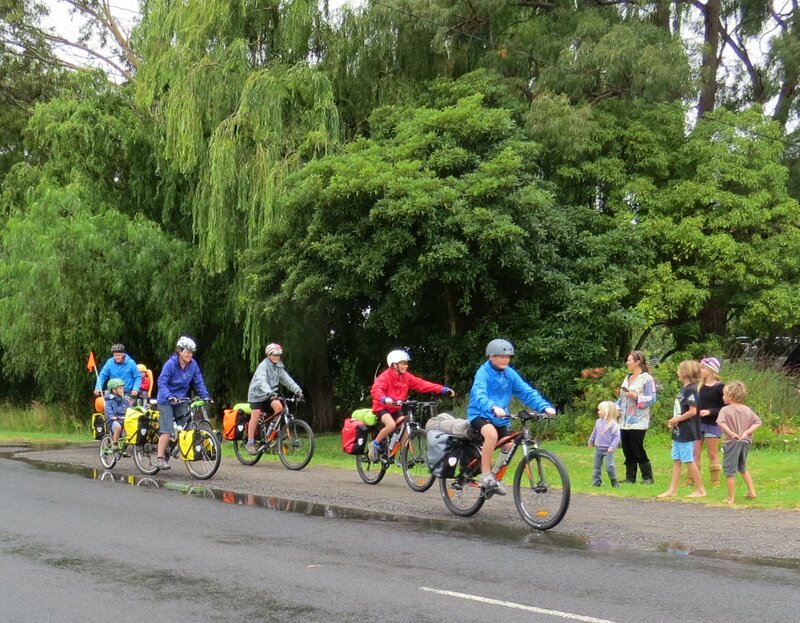 You biked around Tasmania with a 2-year old: an age that generally strikes fear into parents’ hearts. What were some of your secrets for keeping your littlest traveler happy? Take plenty of snacks. We’d ride for 1-2 hours then have a decent break. She was toilet-training at the same time which worked surprisingly well. Remember: the littlest legs haven’t been peddling so they’ll probably want some run around and play time. Little kids love simple things more often than fancier things. A play at the beach or park might be more beneficial than a walk through a museum. Let’s talk gear and what makes/breaks your trip or what’s made traveling as a family much smoother. Anything you absolutely can’t forget? Necessity is what we look for. We invest in what we think we need and ditch what we don’t. Our philosophy is less is better — with so many little children, we still need to carry it somehow. 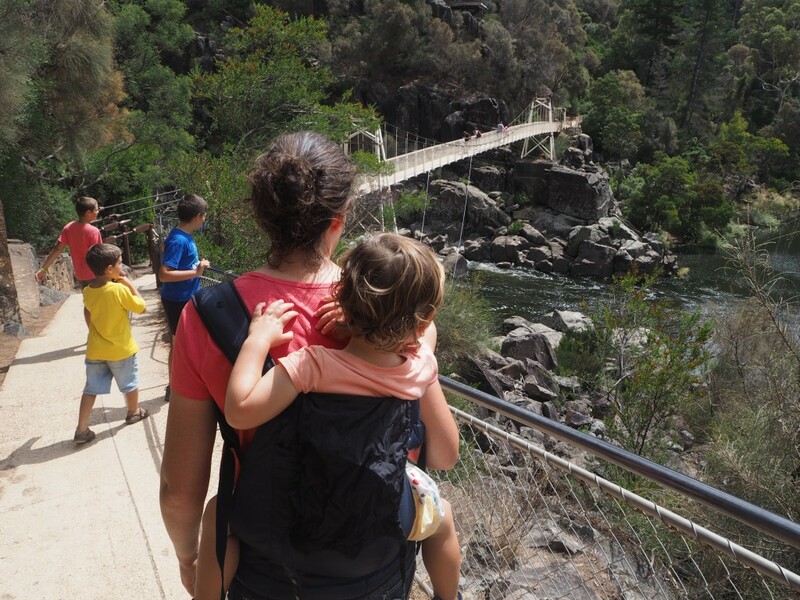 If you are traveling with someone under three, a travel-sized Ergo baby carrier can be helpful. If you are getting a tent, make sure it is easy to put up. There will be times when you need to set it up in the dark while it is raining when everyone is tired. A couple just had a new baby and they want to travel with it. What would you tell them? Babies are great to travel with! All they want is your undivided attention and you’ll be able to give them lots of that. Plus, people are often more friendly towards you when you have babies and small children in tow. Make the most of not needing to buy them a plane ticket while they are under two years old! Get good at breastfeeding. It is the perfect drink/food/comfort for your baby anywhere and anytime. Traveling with a baby is more simple and enjoyable when you don’t worry about bottles and formula. Get a baby carrier like Ergo. You can use it for for a newborn up to a three year old. Help your baby sleep anywhere by not always being at home during nap time. If your baby can sleep wherever you are, you’re good to go. Go easy on the baby equipment: you may be surprised at how much you don’t need. What are your hard-earned tips on making travel work as a family? Take your time where you can as kids don’t like to be rushed. Be patient. Find good playgrounds. Enjoy the process as much as possible. Going to a destination is nice, but enjoying the journey will make it all worth it. Read more about Jacqui and James’ adventures on their blog, There and Somewhere. All photos courtesy of James and Jacqui Rickard.